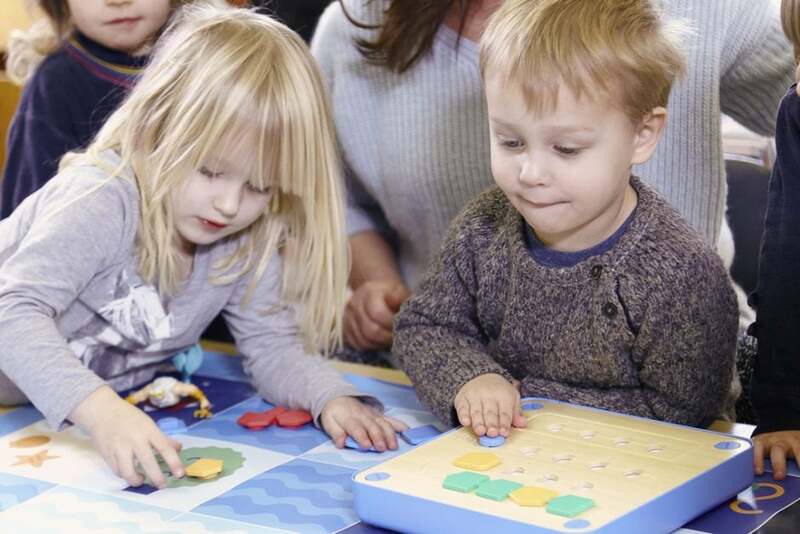 Cubetto is the latest technological advancements in the industry of toys, specially designed to help young kids understand and grasp the main programming concepts. There are many robots for kids out there, but probably none is as useful and beneficial for kids as the Cubetto Playset Coding Toy. Launched as a project by the Primo Toys company, Cubetto is poised to revolutionize the way coding is being taught. Until this London startup decided to create this robot, no other company or joint venture has decided to go that deep into the coding world and create a toy specifically for kids. Amazingly, Primo Toys managed to create a powerful coding learning machine that can be used by kids from all over the planet, and design the first coding enablement tool for toddlers who can’t even write or read. We will dive deeper into the features and benefits of this modern gadget and teach you how you can leverage its potential in order to enable your children to become experts at coding, but not before looking at the benefits of buying a coding learning robot. Why the Need for a Coding Learning Toy? Needless to say, coding is the best skill kids can have in the 21st century. With a huge gap between the need on the market and the capacity offered by coders, becoming a coder is the safest job opportunity for the next generation. But why should children learn to code from such a young age? For starters, coding is by far one of the world’s most widely used languages. Almost every field, whether it’s industrial, IT or economy, relies on computer programs and software for success. It has been predicted than by 2020, there will be more than 10 million unfilled positions worldwide dependent on coding. Second, kids learn much faster when they are young. Their minds are faster, and they can grasp each type of information much easier. Their minds are more flexible and open, so they can easily accumulate all basic coding processes. By grasping these basic concepts from a young age, it becomes easier for them to understand advanced coding and programming once they grow. Ultimately, coding is creativity unleashed. Kids who learn how to code from a younger age are more creative and enjoy a higher self-esteem and an increased confidence in themselves. This empowers them to have success in life and to become expert coders who can earn as much as $100k a year. This is where Cubetto comes in, becoming the perfect enablement tool that reveals the benefits and perks of programming for kids. As one of the most simple robot toys ever released, Cubetto allows children to leverage all mental benefits of coding even from a young age. Inside the box you will find the Cubetto robot, 16 programming blocks, a large board used for programming, 2 1×1 meters world maps and a story book. Each one of the components is required for a certain task and is part of the learning journey. Cubetto looks similar to a small wooden box. This wooden cube-shaped device has one smiley face on the side and an arrow at the top that indicates the direction. Cubetto is powered by 3 AA batteries and comes with a simple on/off switch. It also includes two large wheels that are embedded inside the body. Combined with the plastic bumps on its front and back, this device can easily roll around or turn sideways. In terms of design, Cubetto has an extremely user friendly design, perfect for kids of all ages. Due to the round edges and polished wood, you can be rest assured that your child won’t be hurt while playing with Cubetto. The board is a large panel, made of the same high-quality wood as the robot itself. The board is also powered by 3 AA batteries, so you’ll probably want to buy a dozens of AA batteries next time you go to the local store. On the face of the board, your child will get to play with 16 slots, 12 of which are placed on a back-and-forth line. Each slot has its own LED which turns on when you put a block in it. In order to program, your child will have to use several flat plastic pieces that fit into the slots on the board. The green pieces are for moving forward, while the red and yellow turn left, respectively right. Finally, the blue pieces will run the sequences of “code” on the board. The map is the fun part. This large paper is full of colorful graphics and coordinates that make the game much more interactive for kids. There are a few landmarks, including a boat, mountains and an oak tree, that have their reference in the playbook. While the standard pack contains two maps only, the expansion packs will include additional maps. Now for the last part, this robot for toddlers includes a tiny booklet, or the story book, about the Cubetto character, robots and programming. It’s definitely something you want to read to your child and dive deeper into this beautiful universe. In order to program this coding robot, simply place each block into the corresponding box on the board and hit the start button. The robot will guide your child step by step and teach him how to play the game. Of course, it is recommended to use the instructions for the first time and learn the game together with your little one. Understanding this game might be quite a daunting task. That is why you need to arm yourself with patience and a few hours each day in the first week. If it is hard to understand by adults, it might be even harder for children. However, let’s never judge a book by its cover, as many children are more witty than adults. After your child understands direction, and the difference between left and right, he must learn how to place each block into the right shape on the board. Using the interface board, kids can code their own sequences and then find out what happens. The learning system is cause-effect. This friendly wooden robot is Montessori approved, which means it is extremely easy to utilize by children aged 3-5 years old. The robot moves according to the sequence, once your child presses the blue button. The board lights up at each step, guiding the user through the code. On the board, your child can also code certain functions. This is a more complex coding concept that should be used after learning sequences. As for functions, Cubetto enables your toddler to skip certain squares, move one or two squares faster and reach a destination quicker or slower. As for story books and maps, you need to know that each story corresponds to a certain map. The first book is a complete world map. There are other upcoming maps that will be released in the extended pack, that contains Egypt, space and deep ocean. All books are very beautiful illustrated, containing unique activities and allowing kids to dive into beautiful new worlds. While Cubetto can easily work without a map, it is recommended to let your precious one explore as many maps as possible. His/her creativity will skyrocket and his level of knowledge will grow considerably. There are many Amazon kids toys, but none of them is more useful for modern kids than Cubetto. Out of the wide variety of robot toys of kids, only Cubetto can skyrocket your child’s creativity, boost his self-esteem and set the ground for a bright career as a coder, tester or software engineer. Cubetto offers a simple coding language your child can manipulate and touch. By combining the blocks, your child can execute his very first programs and can dive into the amazing world of coding. Made of tactile, high-quality wood, Cubetto is one of those unique toys for kids you don’t want to miss. 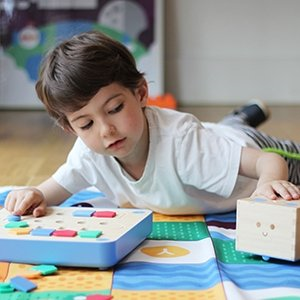 Cubetto is one of those advanced robot toys for toddlers that has been designed for extremely bright minds. If your child is already bright at three, then definitely capitalize on this robot and learn some first-hand coding. Moreover, as kids are better at absorbing information, this is the ideal period in their lives to grasp the basic concepts of coding. As coding is one of the highest-rated jobs in the world, and as there are already millions of vacant positions in programming, website building and app creation, coding will never become obsolete. In fact, by becoming an expert coder, your child can start with an average of $40k a year right after college, and go as high as $100k after 10 years in this field. The company has raised well over $1 million in order to get this product going. At the moment, over 20,000 educators and tutors from over 96 countries around the globe are introducing millions of children to Cubetto. Melissa Stockdale, Massimo Banzi, Randi Zuckerberg and many other famous businesspeople are already supporting this innovation. There is no doubt that Cubetto is enjoying massive support from everywhere, and this could only mean that this device is the real deal. At this time, the Cubetto price I about $290. Of course, it can vary, but this is the actual price in early Fall 2017. A few months ago, 20,000 lucky people have managed to buy it with around $140. However, Soon enough, it might exceed $400, especially as the sales of Cubetto are skyrocketing. So if you are interested, I would buy Cubetto now and invest in your child’s future. Cubetto, a wooden robot that has just seen the light of the day, is breaking new ground on the toys market. 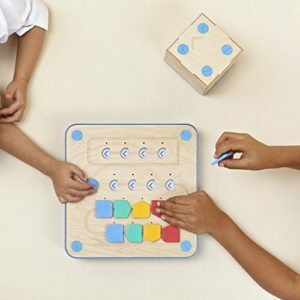 The clever minds from Primo have managed to design an exquisite Montesorri-approved coding toy that can easily introduce coding to 3-years old children. Cubetto has been welcomed with sheer enthusiasm by everyone, from parents and teachers to experts and the press. Ultimately, girls and boys from all around the globe can get a shot at learning to code and to become technology creators. Purchase the Cubetto here.